In other words, the Democrats’ coalition of the ascendant is very inefficiently distributed. We therefore opted to utilize a demographic (urbanicity) that is easily filtered through a geographic component (CBSAs) and that people intuitively think of in geographic terms. 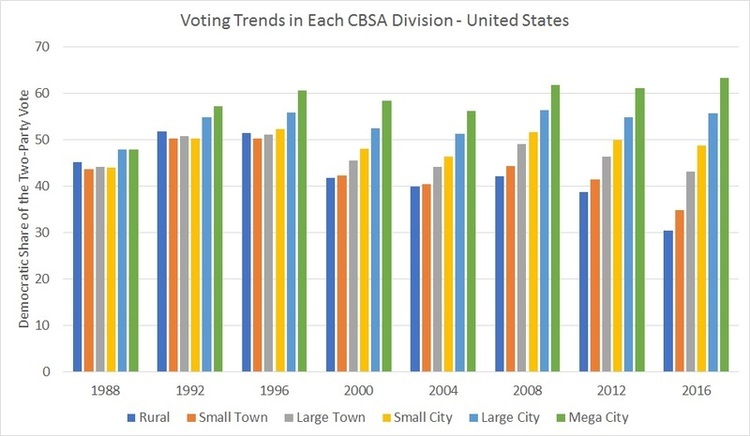 What we discovered is a different dimension to the Democrats’ demographic inefficiency problem: They are becoming far too clustered in urban centers to be effective, even when they win the popular vote. But we get back to our initial point: In our system of government, popular vote metrics are only sensible when put through a geographic filter. This causes problems in the Electoral College, which we’ve recounted before. There are only nine “mega-cities” in America: New York, Los Angeles, Chicago, Washington, D.C., Philadelphia, Miami, Atlanta, Houston, and Dallas. These, in turn, affect 11 states: New York, New Jersey, Connecticut, California, Illinois, Virginia, Maryland, Pennsylvania, Florida, Georgia and Texas. We close with the following thought. This happened for a reason, and since it happened for a reason, it is probably reversible. But it won’t happen overnight. Democrats were once able to win rural areas, and send large numbers of members of Congress from these places. That was in part because they focused their message on these areas, and tolerated culturally conservative Democrats like Harold Volkmer in Missouri and Sonny Montgomery in Mississippi.